Interactive objects and IoT devices need a proper interface. Simple character LCDs and buttons are useful but nowadays considered obsolete. Rather a device with a mobile interface is more and more appreciated. That is the reason why a ready to use App has been integrated into the Zerynth stack. Using it you can turn any mobile into the controller and display for smart objects and IoT systems! 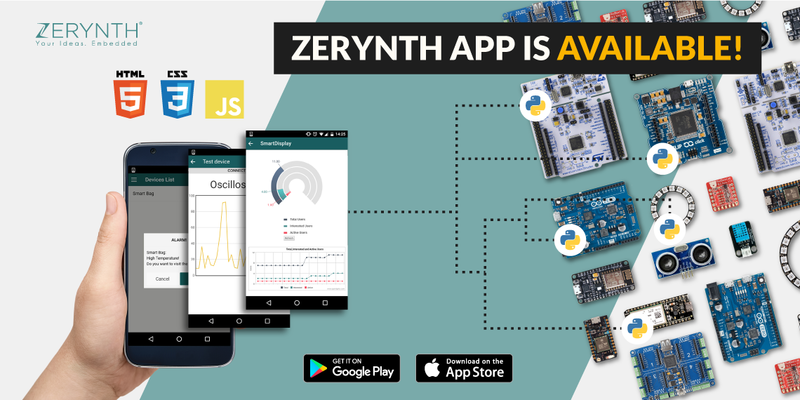 In particular, you can manage and control the connected devices programmed with Zerynth Studio, enabling a bidirectional communication channel between them and your mobile. Zerynth tools strive to be as agnostic as possible and Zerynth App follows the same philosophy. Until now, you could use Zerynth App only on Android. We are now pleased to announce that Zerynth App is compatible with iOS too. Any data collected or generated by Zerynth powered devices (i.e. room temperature, room light and sound level, etc.) can be shown on mobile by sending an event (and event push notifications!) from Python to the App. The communication also happens the other way round with the App sending events to the Python script which in turn can execute functions. Therefore the App can also work as a remote controller, by specifying in the Python script which event triggers a specific callback (e.g. a switch button in the App can turn a led on and off). Find out more on the documentation page. From prototyping to production without pain! We are working to make Zerynth App the definitive tool for prototyping UI for connected devices. But our mission is to help you to switch from prototyping to production as quickly as possible. Once your prototype is ready, you haven’t to rebuild your app from scratch! You can develop your own mobile App using the Zerynth Android or iOS SDKs (this feature is coming soon!). Zerynth App is just one of our tools. Take a look at the “Get Started” page to learn how Zerynth can help you scale up in the market. In particular, Zerynth Studio that enables features including power saving, selectable RTOS, over-the-air updates of the firmware and hardware-driven secured firmware burned on the device at industrial volumes. Take a look at this tutorial to see how to develop a simple but powerful IoT Thermometer, using a Zerynth-powered single-board microcontroller and the Zerynth App as the remote display.